Sometimes in life, a fortuitous encounter occurs when you least expect it. A friend introduced me to Davis Jones one evening in San Francisco and we fervently discussed various bands and our unconditional love of music for a few minutes before realizing who each of us was talking to. A native of Akron, Ohio (you know, that city in the midwest that spawned a little known band called The Black Keys), Jones has quietly built up an impressive catalog of albums since 2004 and been a fixture on the San Francisco scene this past year playing at cozy venues like Viracocha, Bazaar Cafe, and Giordano Brothers. Jones' most recent album, Royal Jelly, released in 2011, is twelve songs of easy acoustic guitar listening and sweetly composed lyrics that are comforting and intimate. Jones' songwriting is the product of cerebral exploration – taking a step back and collectively observing his own life experiences and memorializing those experiences in a song as if he's taking little snapshots of his life at various points in time. Particular stand out tracks on Royal Jelly include “In Between,” with harmonica solos adding a layer of soulful lamenting and “I Found You,” a lovely tune where Jones puts his emotions out on the table for the taking. Jones started out as a one man show with just his acoustic guitar at live performances. In the last few months, he has pulled together a full band called Akron Engine to accompany him. 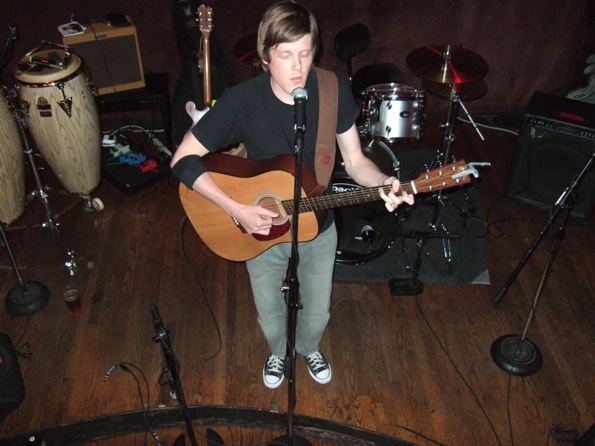 Check out Davis Jones and Akron Engine at Hotel Utah in San Francisco on February 15th at 8pm. Listen to Royal Jelly in its entirety here.